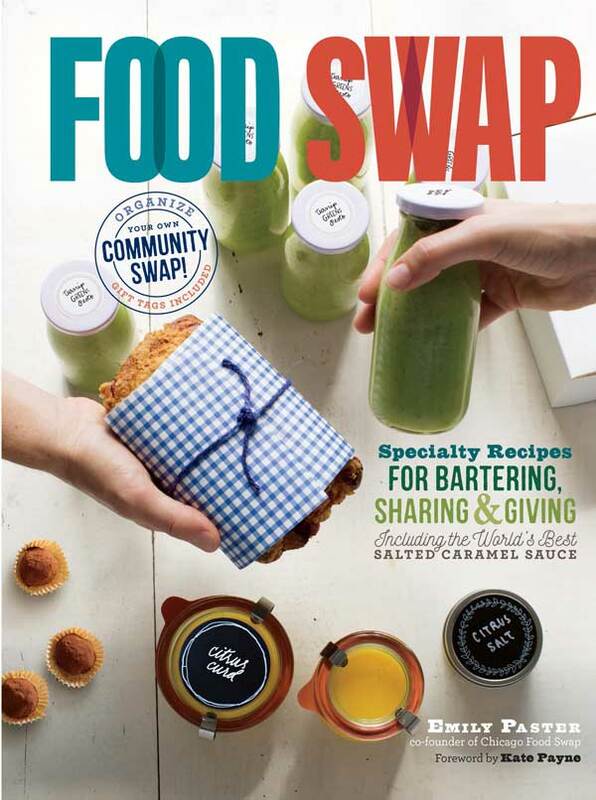 For the past year I’ve enjoyed attending The Chicago Food Swap, and today I am happy to announce the release of the swap’s cookbook, Food Swap, Specialty Recipes for Bartering, Sharing and Giving. 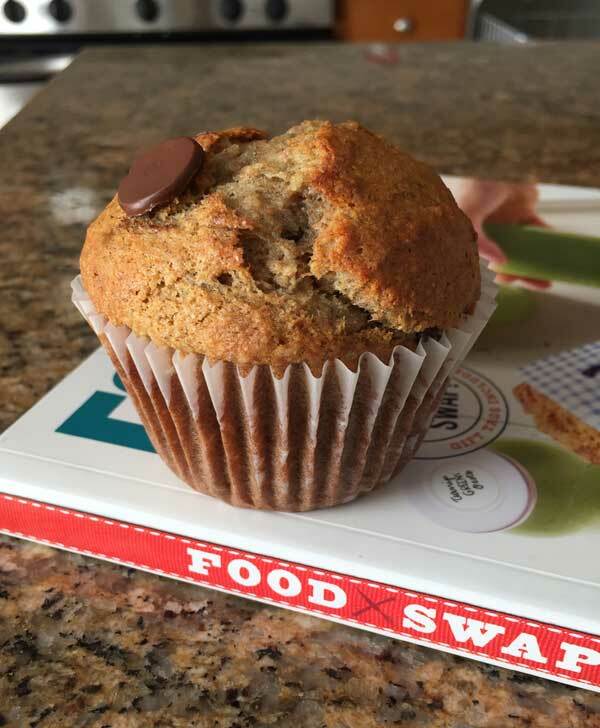 These Banana Chocolate Muffins are from the book, but before I get to the recipe I want to tell you a little more about food swaps and this great new cookbook! First, a food swap is kind of like a soup swap or a cookie exchange, but instead of exchanging soup or cookies, bakers, cooks, gardeners and canners meet in a designated location and swap things like jam, pickles, bread, soups, salads, extracts, baked goods or whatever they’ve been creating in their home kitchens. No money changes hands, and swappers leave with a variety of foods to be used as ingredients, snacks or meals. 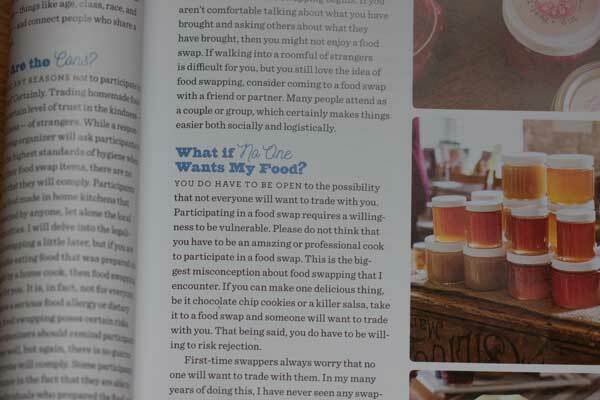 Written by Emily Paster of The Chicago Food Swap, Food Swap explains the history of swaps, how you can start one, where to find a swap, and swap etiquette. In addition to the logistics and legalities of swaps, Emily also explores the psychology behind swapping, who does it, why people do it, and how to cope with situations where the swap doesn’t quite go your way. I will attest to having left a swap feeling like I could have done better or wondering why I didn’t make X,Y,or Z or package things differently. As Emily mentions in the book, one of the many reasons to attend a food swap other than the social aspect is it helps you step up your game in the kitchen. I always come away from a swap feeling like I learned something. Obviously, I recommend this book! Even if you are not planning on starting or attending a swap, it’s a fantastic resource for food gift ideas. Along with the Banana Chocolate Muffins a few other recipe titles are Cultured Butter, Creamy Ricotta, Beer Caraway Mustard, Garlicky Dill Beans, Pickled Fennel, and Patty’s Carrot Soup, which is something I tried at the swap this past weekend and plan on making very soon. And there are more. Many more. Now here’s the recipe for Banana Chocolate Muffins. I baked up a half batch of these last night and loved the results. The muffins rose nicely, had beautifully rounded tops, and the flavor level of the banana was just right. With banana, wheat, flax and chocolate, these muffins had a lot going on. The full recipe makes 24, but as mentioned it can be halved. As Excerpted from Food Swap (c) Emily Paster. Used with permission of Storey Publishing. This recipe comes from swapper Genevieve Boehme, a regular at the Chicago Food Swap, where these muffins are very popular. Genevieve has adapted a favorite recipe to include whole grains and be less sweet than the typical breakfast muffin. With whole-wheat flour, wheat germ, and bananas, these muffins are practically health food. Okay, maybe not. But the whole grains do add a delightful nuttiness. Preheat the oven to 375°F (190°C). Grease muffin pans or line with paper liners. Combine the flours, sugar, flaxseed, baking soda, salt, nutmeg, and ginger in a medium bowl and whisk thoroughly with a fork. Whisk together the oil, eggs, bananas, and buttermilk in a large bowl until well combined. Add the dry mixture to the wet ingredients, and mix well with a fork until everything is well incorporated. Fold in the chocolate chips. Bake for 18 to 22 minutes until muffins are golden brown and the tops spring back when touched. Cool them in the pan for about 5 minutes, then remove to a wire rack. Genevieve packages these muffins by four in a quart-size box, such as those you find at farmers’ markets, lined with parchment paper. Cover with plastic wrap, tie with a pretty ribbon, and add a tag for an attractive presentation. A local coffee shop makes a banana chocolate chip muffin that I love. I will have to try these! The book sounds like it would be a wonderful gift! Anna, I’m so glad you were happy with the muffins! I’ve been making them for years and my kids love them. Lovely review, and looking forward to swapping again soon! Thank you Anna for this wonderful review. How fortunate for us that your family moved to Chicago and you started coming to the swap. I am so glad to have gotten to know you and to try your recipes! Love the idea of swapping homemade goods. Sounds like a great book for even gift ideas.